Expectations for a dovish Fed in 2019 are taking some air out of leveraged loans, the market for large corporate debt that has the attention of economists and regulators searching for the next asset bubble. Leveraged loans — and the collateralized loan obligations they are packaged into — are floating rate investments, meaning they’re a favorite for investors looking for attractive yields in a rising rate environment. When interest rates go up, so do returns on floating rate instruments. But with the Fed signaling in its December meeting that it is backing off of its original projections for three 2019 rate hikes, leveraged loan markets have seen dramatic outflows as investors flock back to fixed-rate assets. 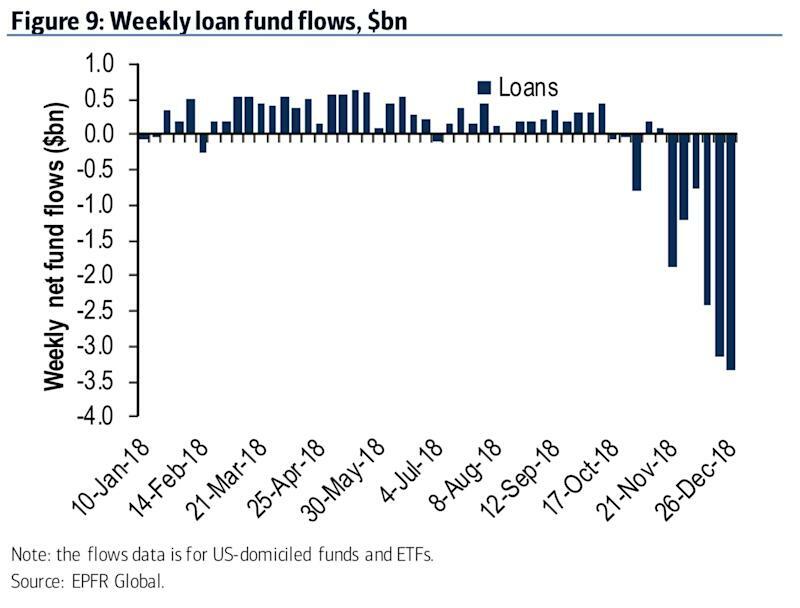 Bank of America’s Yunyi Zhang noted that each week seems to bring a new record level of outflows from U.S. leveraged loan funds and ETFs. For the week ended Dec. 26, loans saw $3.35 billion in outflows, adding up to a cumulative $12.78 billion in outflows over the last six weeks. Bank of America highlights EPFR Global data on the outflow from loan funds. The shakeup in leveraged lending is rattling historically steady funds. The Invesco Senior Loan ETF, which invests primarily in the largest institutional leveraged loans, has lost more than 5% in the last two months, similarly revealing investor flight from the riskier corners of the fixed-income markets. Jay Bryson, global economist at Wells Fargo, wrote in a note that the weakness in recent weeks “may bring back unpleasant memories of the sub-prime loan debacle a decade ago,” noting deteriorating conditions in the non-financial corporate sector. Bryson told Yahoo Finance that while he doesn’t see leveraged loans bringing the economy to its knees anytime soon, corporate debt has weakened as companies with heavier loads of debt yield lower returns on assets. “If i had to give a letter grade to the corporate sector I would give it a ‘B-’ right now,” Bryson said. To be fair, leveraged loans have historically low default rates, but if interest rates continue to rise, speculative-grade corporate bonds could see upward pressure. 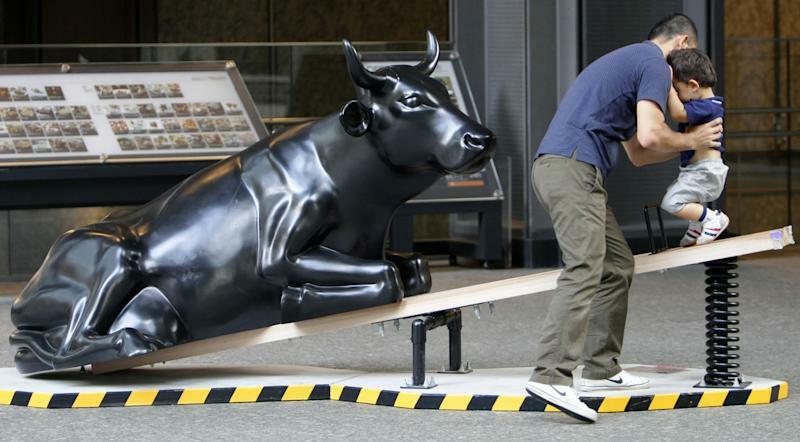 That could exacerbate already tight financial conditions in a late-stage economy that some see headed for a slowdown. In its final FOMC meeting for 2018, the Federal Reserve raised rates by 25 basis points for the ninth time in this cycle. For corporate borrowers, a rising benchmark interest rate makes it more expensive to pay off the leveraged loans often used for expensive transactions like a buyout. With corporate debt market conditions deteriorating, concerns are mounting that if those companies are unable to meet their loan obligations, the leveraged loan market — and the collateralized loan obligations they are wrapped into — could come crashing down. Fed Governor Lael Brainard has joined the likes of former Fed Chair Janet Yellen and the incumbent bank regulators in actively sounding the alarm on leveraged loans. Brainard has called particular attention to the fact that about 80% of the market features “covenant-lite” investor protections that expose the lender to more risk. Leveraged loans are also levering higher; the debt to projected earnings before interest, taxes, depreciation, and amortization has only increased over the past few years. Bank regulators previously warned banks against originating corporate loans that would saddle borrowers with debt in an amount more than six times EBITDA. As banks backed out of the market due to increased regulatory scrutiny, non-bank lenders embraced leveraged loans. Unlike the mortgages that triggered the last crisis, analysts say leverage loan risk is not concentrated in the banking industry. UBS noted earlier in December that collateralized loan obligations (owned by non-bank funds and other institutional investors) and Japanese banks are the ones buying loans. As such, the U.S. banks say they are not worried about it, since their direct exposure is low compared to the yield-hungry investment funds shopping leveraged loans or CLOs. In an interview with CNBC, JPMorgan Chase CEO Jamie Dimon said leveraged lending is a non issue.